No. That’s really not what I’m talking about.That’s just what it says - an up converter and an LNB. You still have to get the LNB IF down-converted if you want to receive on the same radio that you are using to up-convert. Left hand side of advert - up-convertor, right hand side of advert - down convertor. The down-convertor injects a 9GHz signal in, it seems - what IF is that going to be; 10,490-10,500MHz minus 9360MHz = 1130-1140MHz - a little below 23cm. I wonder why that is? The LNB/Down convertor is already sold out, I can’t find the up-convertor in the price list. So all very new of course. And you do have to supply your own dish(s). Or VK is in the wrong place. Can’t you sail VK around Cape Horn and position it in the South Atlantic? It’s not in the wrong place, it’s a second payload on a satellite that will provide TV and data services to Europe, the Middle East and Africa. AMSAT-DL were lucky to get the opportunity. The whole of North America (and a lot of South America) are not in the footprint as well. Once AMSAT-NA get their geostationary Satellite up (when, I don’t know) they will no doubt add NA coverage but I wonder if the future geo-stationary amateur satellites will ever be linked via an earth station to give half the globe coverage? Actually I hope not as it’ll just be like using a cell phone then to make DX contacts. Someone has just posted a video showing reception of the downlink with just an LNB - no dish! Smartphone, OTG, DVB-T Stick, Octagon LNB. …this is getting seriously portable. Can you give the link to the video please. My first attempt with Es Hail was yesterday from the back garden with Four QSO’s. G, GI, GM, ON, D, and 5B4. 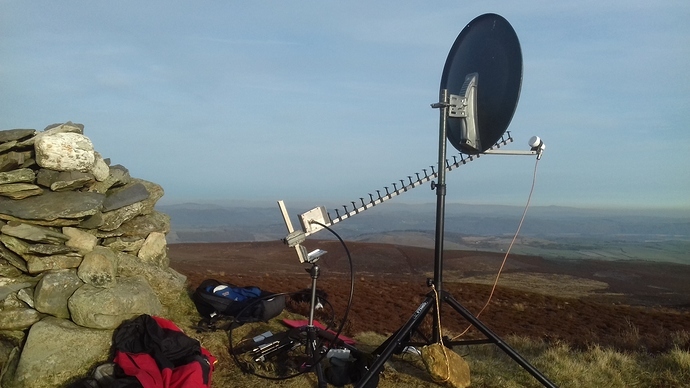 80cm sky dish and an SDR running on a tablet for the downlink and an SG-Labs Transvertor running a barefoot 2 watts with a 27 ele Tonna for the uplink. It’s too much kit to take up a serious SOTA, but got to start somewhere. Well done. A SOTA first! Hi Nick, how do you align the dish and TX antenna? There are apps let you convert the sat’s position into azimuth and elevation for a given location. If you know the azimuth then a compass is sufficient and a protractor can be used to get the elevation. There’s lots of signals on the sat so once it’s in the right ball park you can peak up the dish using the SDR display. Then TX on 13 and tweak for maximum signal. Once you’ve done it a few times you build a feel for where the antennas should point. Well done Nick - superb, and as Richard says a first on E’sHail 2 (Oscar 100), but I wonder if it has been done before on the lower 70cms/145 Leo’s? Checking through the SOTA Database there doesn’t seem to be a separate classification? Possibly microwave?? Looking forward to having a go myself in the coming months. I used a 2nd hand dish so the elevation it was set at for Sky was a good starting point. I selected Eutelsat 5B which is very close to EsHail to get the azimuth. After that it’s just a matter of fine tuning the azimuth and elevation. After few attempts you can get it in the ball park straight away. When away from home I used a compass, that website gives the bearing and elevation . Someone has just reported a successful Es’hail QSO with 32 dBm into a quad patch PCB antenna on transmit. Patch pessimistic gain is 7dBi (just checked 'coz I thought it was 8dBd). He said the gain of his antenna was 11dBi.